The Fiddlehead Summer Fiction Issue Launches this Thursday! We're pleased to be launching our summer fiction issue at Westminster Books (445 King Street) this Thursday, July 30, at 7pm with our friends at Qwerty, who are celebrating their new joint issue with Echolocation. There will be short readings from both magazines. Read more about The Fiddlehead Summer Fiction Issue Launches this Thursday! All are invited to the launch of M. Travis Lane's new book of poetry, Crossover. which will take place next Thursday, June 11 at 7 pm. Lane is well known to readers of The Fiddlehead. Last summer, we featured a retrospective of her work, and her poems and reviews regularly appear in our pages. The event is taking place at Westminster Books in downtown Fredericton (445 King St.), and is free and open to the public. Fiddlehead fiction editor Mark Jarman will be reading from his new book Knife Party at the Hotel Europa in multiple locations in Western Canada next week. The Vancouver Sun has recently called Mark's book "fierce and beautiful, one of the most stunning books I’ve read in a long time, and one which should not be rushed." The Confederation Centre Public Library in Charlottetown hosts book launches by Fiddlehead contributors M. Travis Lane and Zachariah Wells. Lane launches her new book, Crossover (Cormorant), her fifteenth, and Wells is launching his third book, Sum (Biblioasis) on May 9 at 2pm. 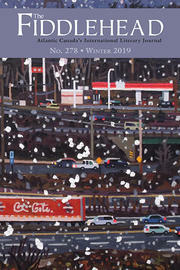 Lane was featured in a special retrospective in last summer's poetry issue (no. 260), and Wells' most recent contribution was in No. 251 (Spring 2012). Michael Pacey launches his new book Electric Affinities Thursday, April 23, at Westminster Books. The reading is at 7pm, and it is free and open to the public. Ross Leckie, The Fiddlehead's editor, and Anne Compton, whose most recent Fiddlehead publication was in last year's summer poetry issue, will be reading at Saint Mary's University in Halifax tonight (April 13th) at 7:30 pm. The reading will be held in Sobey 255, 903 Robie St. Admission is free and all are welcome. The University of New Brunswick would like to invite you to hear readings by acclaimed writers, Matthew Heiti and Mark Anthony Jarman. The University of New Brunswick would like to invite you to hear a reading by writer Kerry-Lee Powell. Her poetry collection Inheritance was published last year by Biblioasis. Inspired by a shipwreck endured by the author's father during the Second World War, and by his struggle with post-traumatic stress disorder and eventual suicide, Inheritance is a powerful poetic debut. Come to the Wilser's Room in the Capital Complex on Thursday, February 26th to see two of The Fiddlehead's editors, Mark Anthony Jarman and Ross Leckie, perform their featured readings for this month's Qwerty Reads event. The University of New Brunswick would like to invite you to hear a poetry reading by the Poetry Editors of The Fiddlehead: Phillip Crymble, Claire Kelly, and Ian LeTourneau.